The US border wall has already proven to be one of the most contentious political issues of the year, and it’s barely even February. While the implications of both the wall and its funding situation are wide-ranging, one crossover I didn’t see coming was with Rainbow Six Siege. Yesterday, Univision Arizona ran a news report about Donald Trump’s proposed immigration solution, which would run along the US’ southern border. The channel serves the 1.6 million Hispanic people living in and around Phoenix, Arizona, some of whom were greeted during that report with a face they recognised from Rainbow Six Siege. As pointed out on Reddit and Twitter, the broadcast saw one of the game’s operators, Blackbeard, appear behind the TV station’s two anchors, accompanied by the text “seguridad en la frontera” (spanish for “border security),” and a mockup of the wall. It didn’t take fans very long at all to notice his presence, and you can take a look at their findings for yourself further down the this article, via a Reddit post from NotAaron147. 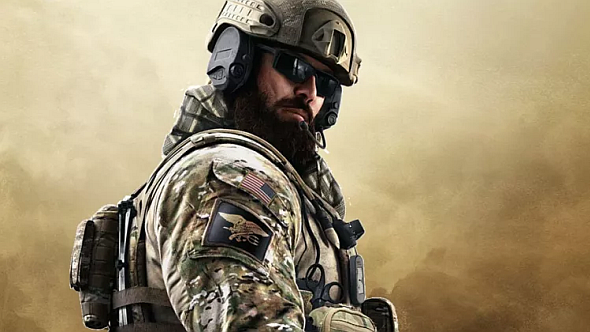 To the credit of whoever put that graphic together, Blackbeard’s lore has him down as a US Navy Seal, but while the country of origin might be right, I don’t imagine that Trump has the special forces in line for border patrol. The border wall has indirectly caused controversy within the gaming industry already this year. Last month, Ubisoft apologised for a marketing email for The Division 2. The email made light of the government shutdown – caused by disagreements over funding for the wall – which temporarily left 800,000 government employees without pay. Elsewhere in Rainbow Six Siege, players are gearing up for Year 4. Ubisoft has promised an hour of info at next week’s Six Invitational, so expect a pretty busy 12 months for the tactical shooter.